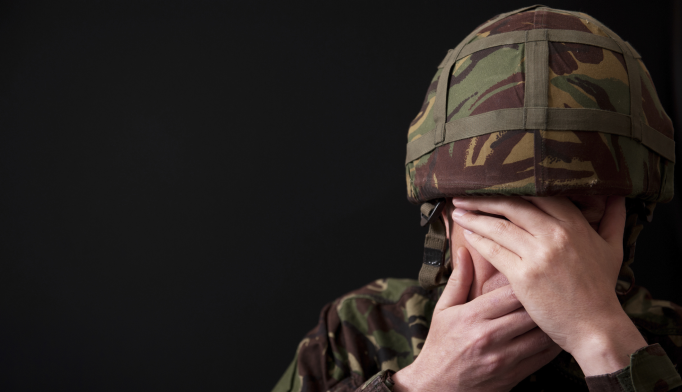 Military personnel with blast-related mild traumatic brain injuries who also experience early post-traumatic stress disorder (PTSD) symptoms have an increased risk for later disability, according to a study published in the journal Brain. The researchers found that symptoms like anxiety, emotional numbness, flashbacks, and irritability were stronger predictors of later disability than cognitive and physical assessments. The study included 38 patients who had been diagnosed with blast-related mild traumatic brain injuries and 34 military members without brain injury who volunteered to serve as controls. Early assessments were made within the first week of injury, with mental health evaluations included. The follow-up mental health assessments were conducted six to 12 months later along with standard interviews. At follow-up, the researchers classified 63% of the brain injury group as moderately disabled, compared with 20% of the control group. Moderately disabled was defined as being unable to work as they did prior to injury, being unable to continue previous social and leisure activities, or having mental health problems that disrupted relationships. Previous studies had primarily focused on physical and cognitive factors as predictors of later disability, but the results of this study suggest that mental health plays a larger role than previously thought. As such, the researchers recommend that care for brain injuries in military personnel gives more focus to psychiatric symptoms. For military personnel with blast-related mild traumatic brain injuries, early symptoms of post-traumatic stress such as anxiety, emotional numbness, flashbacks, and irritability are the strongest predictors of later disability, said researchers from Washington University School of Medicine in St. Louis. Investigators were surprised that mental health issues more closely correlated with disability than cognitive and physical assessments typically made after concussions such as tests of memory, thinking, balance, coordination, and severity of headaches and dizziness. “Symptoms of post-traumatic stress and depression have always been thought to develop months to years later,” said David L. Brody, MD, PhD, associate professor of neurology.